St. James, the writer of the New Testament Epistle, was in a unique position to guide Christians in the first century, and today his letter is essential for a practical understanding of Christian living. The Epistle of James is beloved for its directness, brevity, and practicality. 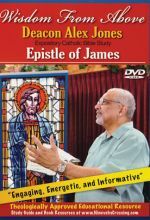 In this series of Bible studies, Deacon Alex Jones uses the teaching of St. James to show how Christians can live joyfully in the face of trials, temptation, and suffering. Includes 2 discs containing 13 lessons (approximately 30 minutes each.) 6 hours total.